San Fransisco workshops now open for bookings! I am thrilled to be making a return visit to San Fransisco this Fall and Jamie and Blas of Urban Fauna Studio and Mary Jane’s Attic fame have put together two wonderful day workshops, Felt Accessories on Saturday 2nd and Felt Vessels on Sunday 3rd October! The 2nd is actually World Felt Day so how much fun is it that we will be felting together and creating fibre magic in such a stylish part of the world? 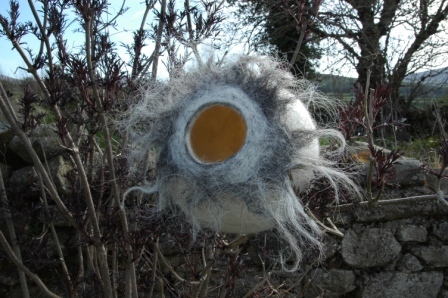 I know that you have seen a picture of this felt vessel before but I am pretty excited to reveal that it has just been selected by a top UK trend forecaster to be featured as one of the images on their ‘Hunter/Gather’ mood board for Autumn/Winter 2011/2012! If you would like to learn how to make a fun vessel like this why not join me in San Fransisco??? Rug update – I was in the middle of ironing the rug yet again this afternoon prior to a final rolling but all the steam caused my bandage to loosen and then I knocked my finger, loads of blood all over again, so annoying. Between tomorrow and Friday I will roll a little and spot full anywhere I am not entirely happy with, hope Sylvia likes the result when I deliver it on Monday! This entry was posted in America 2010, Felt and tagged Felt, felt accessories, felt accessory, felt vessel, felt workshops, Felting, San Fransisco, Urban Fauna, Urban Fauna Studio by Nicola. Bookmark the permalink. Just going through your posts from my five day absence…Sure missed your columns, but had a great, great time at the felt gathering here in Michigan. Were your ears ringing? Heather and I had the best time together and can hardly wait to meet you. Great news about your vessel! Hope your finger is healing up.